In the 980 year reign began in Kiev, Prince Vladimir Svyatoslav. In 988, Vladimir married the Byzantine princess Anna, and the Rus was baptized in the Orthodox rite. In the last decade of the 10th century Russian princes, led by Vladimir, nicknamed "Red Sun", wage war with the Pechenegs, a number of outposts erected at the turn of the southern steppe people to deal with successfully fighting the white Croats, Poles, Volga-Kama Bulgars, Caucasian Khazars. Christianity spread throughout the Russian land. In the first half of 11th century Russia, breaking the fratricidal conflict between the princes, the sons of Vladimir, who is entering a period of its greatest prosperity. During the reign of Yaroslav the Wise (1019-1054 gg.) Kievan Rus took the area from the Taman Peninsula in the south of the Dniester and the Vistula in the west to the Northern Dvina River in the north. The ruling dynasties of Europe tend to intermarry with the Grand Prince of Kiev. In 1043-46 years. occurred the last armed conflict between Russia and Byzantium. A successful fight against the Poles rejected the threat to the western borders. Of particular concern brought the nomads of the steppes of southern - Pechenegs. In 1036 a fierce battle at the walls of Kiev ended in complete defeat of the Pechenegs. Many of them were killed or drowned in the river, while the rest went to the Danube. Place Pechenegs soon became another enemy of the southern Russian border. In the steppe there are new owners - Cumans. 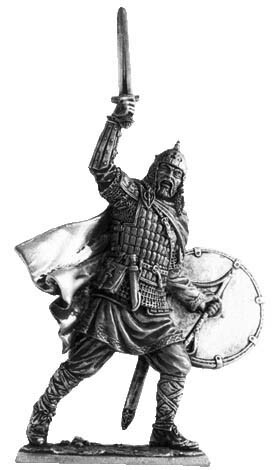 Noble prince druzhinnik - clad in armor, over which the plate is put on lamellar armor. Steel plates of the armor placed overlapping each other and held together with leather laces. Right arm to the elbow prevents bracers, made ​​a series of iron bars, work-hardened to a leather base. Riveted on the head of the four parts of the helmet with chain mail spheroconical barmitsa swing. The best and most expensive helmets of this type are covered with gilded copper. Helm, the crown, side outlet and trident Headlight overlay of silver. The shield is round, made ​​of planks and covered with a thick skin on both sides, painted in red. The edges of the shield further trimmed with leather and reinforced with iron oboymochkami. Handle the north-western type - in the form of a wooden beam. Slot in the shield for the hand grip is closed in the front hemispherical steel umbonom. Sword of the classical European Carolingian type with handle, decorated with silver and bronze. On his feet leather boots and the linen winding, overgrown with straps fastened under the knee buckles small - brooches. Easy hiking cloak also bears the fibula on his right shoulder. On the belt, decorated with bronze plaques hung a leather purse and a combat knife.